If you know what to expect from your body after a car accident, it can be a little less scary. 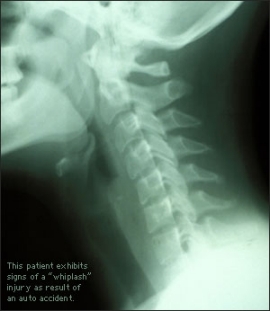 The most common injury from a car accident is whiplash in the neck. This means that your neck went through a rapid, forceful backward and forward movement without regular muscle control. - Onset of neck soreness by the end of the day. - Headaches in the base of the skull that may wrap around your head. - Head may feel heavy and be difficult to hold up. - Ice your neck for 10 to 15 minutes 3 to 5 times per day. maintain good posture, gently rotate your head from one side to the other. Avoid pushing into pain. -Numbness or tingling in your face, hands, or feet. -Changes in your vision (double, blurry) or speech (slurred). -Light-headedness, dizziness, loss of consciousness, or nausea. -Changes in bowel or bladder function. -Co-ordination problems (unusual clumsiness such as dropping things, bumping into walls). accidents that require a multifaceted approach to ensure maximum recovery.